Sorry kids, the train has definitely left the station. 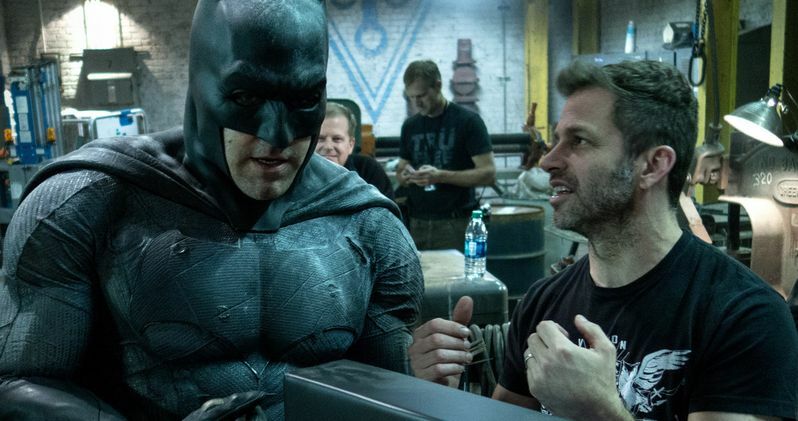 Zack Snyder is directing Justice League Part 1, and there is nothing you can do about it. Despite that, some enterprising fans are trying to take matters into their own hands, setting up two different petitions hoping to get the Batman v Superman: Dawn of Justice director fired from the next big DCEU ensemble adventure. Will it work? Probably not. Batman v Superman: Dawn of Justice is one of the most divisive movies to come along in years, and it has worked at tearing vast sections of the fan community apart. Some love it, some hate it, but all critics agree that it is a disaster. Even before it opened, there was some speculation that Warner Bros. was nervous about the movie. They knew it was going to garner some bad press. But they probably never imagined just how poisonous this well would prove to be. There was some speculation that Zack Snyder would be fired from Justice League Part 1, and the movie would be delayed. Nope. It's confirmed that this 2017 release begins shooting in just a few short days, and that it will definitely be under the direction of good ol' Zack, who's not exactly the Man of Steel when it comes to directing, but more like The Man of Teflon. Many fans believe the weight of the DCEU is just too much for Zack to carry on his shoulders, and that he should have stopped with Man of Steel back in 2013. In an unprecedented move, there are not one, but two, petitions currently catching fire over at change.org. And both are asking for Zack Snyder's removal immediately not just from Justice League Part 1, but anything to do with the DCEU. The first Petition comes from fans in the United States, and already has 713 supports on its way to a thousand, with word just starting to spread. Launched by a man named Bryan Curz, he is directly petitioning Warner Bros. to stop the madness. In his plea, he argues the following so-called facts. "Zack Snyder is not the person to bring the Justice League to the big screen. He's had two chances now to adapt DC characters and has produced middling results. Even if you loved Man of Steel and BvS. There has to come a time when WB and DC want someone at the helm that can create something that WON'T divide people in such a way. The building blocks are there for a great different set of superhero movies. Good actors and actresses and even directors. Zack Snyder is just not the guy that should be in charge of the biggest and most important films in the franchise. Especially with his track record now." Ok. Fair enough. It's definitely in the court of public opinion now, whether or not you feel Zack Snyder did right by Batman v Superman: Dawn of Justice and if he's the right person for the Justice League Part 1 job. But fans in the U.S. aren't the only ones upset about the director's continued participation in this cinematic universe. The second Petition comes direct from India. It has far less supporters at the moment, with only 314. Launched by Taufique Radhakrishnan, it not only targets Warner Bros., but also studio CEO Kevin Tsujihara. The sentiments here are pretty much the same, perhaps a little harsher. "This guy has already doomed the franchise with two critical flops in Man of Steel and Batman v Superman.He's a great visual artist,but cannot tell a good story.The only chance of redemption for DCEU is to hire a director who's not as polarizing as Snyder,who understands the characters well,doesn't make them roam away from their mythos and balance the tone of the future movies." Both petitions were actually started 6 days ago, prior to the wide release of Batman v Superman: Dawn of Justice. In all likelyhood, these two enterprising individuals were attempting to jump on a bandwagon, suspecting that fans would also hate the movie. Who's to say that either man has even seen the movie yet? At this point in the game, it's extremely doubtful that Warner Bros. and DC would pull Zack Snyder off Justice League Part 1, especially with production set to start so soon. A recent petition asking to have Colin Trevorrow removed from Star Wars: Episode IX and be replaced by George Lucas fell on deaf ears at Disney and Lucasfilm, despite 25,482 supporters feeling that it was the only decision. What do you think? Should Zack Snyder be fired from Justice League Part 1 and the rest of the DCEU? Is he the right choice? Are these petitions just a waste of time? Sound off in the comments below.